Need guidance? This book will help you know when to start potty training. Each new adventure you embark on as a parent lets you know in a hurry how clueless you are and how much you’re really learning on the job as you raise your kids. There is no manual for raising kids, but there are manuals for many steps along the way. And just like Elizabeth Pantley’s No-Cry Sleep Solution saved my sleep and my sanity, I have a feeling her similarly titled book on potty training will do the same. My now 2-year-old daughter started giving us clear signals about impending “movements” all the way back in December. But with a baby on the way and a clear lack of interest after a few potty successes, we opted to hold off on any sort of formal potty training until now. (Formal potty training. She wears a prom dress!) We had started putting her on the potty before baths and had some success, but what was the next step? Where on earth do we start this process? 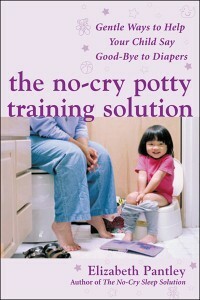 I turned to The No-Cry Potty Training Solution for guidance. The author lays out potty training in an easy-to-follow format. Like her other books, she gives parents options, so you can pick and choose what works for your family; there is no one-size-fits-all method. The quick guide chapter is a great crash course in all things potty training, but the whole book was such a quick and easy read that I flew through the whole thing really quickly. With my 2-year-old, my main concern was starting the process too early. That’s what the Readiness Quiz is for. Take the quiz and gauge how ready your child is for the adventure. Also important? The readiness of the parent. It sounds funny because what parent wouldn’t want to graduate from the diaper stage? But after a few days of constant trips to the potty, you realize how much energy and time it takes to potty train—diapers start to look quick and easy! The book definitely made me feel more laid back about the whole experience. With tons of tips and strategies plus troubleshooting and answers to common questions parents have, this book really helped me out. The author reminds you that kids don’t learn any skill all at once and that there are bound to be accidents and setbacks. Plus, it doesn’t have to be an all-or-nothing approach, so we’re easing into it fairly slowly with regular trips to the bathroom but plenty of patience, pull-ups and a sense of poop humor. I got Elizabeth Pantley’s “No Cry Sleep Solution” per your recommendation. I loved that book and it helped so much. I’ll definitely give this one a try as my toddler will turn two in October. I was never in a hurry to start potty training because it requires a total commitment. That means absolute consistency. You can’t start potty training and then plan a trip and postpone the training until you get back. So I never committed to that process until I felt both the baby and I were ready. My approach was very simple, you train the child’s potty times and also the time spent on the potty. Almost like a bowel training program. We would eat breakfast in the morning and get on the potty. Same with lunch and dinner. While on the potty we would sing, read a book, whatever we needed to do except sleep, until we got product. Then we celebrated. We stayed in diapers even after I was pretty sure that we had achieved potty success because accidents can be traumatic. No soiled clothes, no public embarrassment, etc. And most of all, no time schedule. After successful #2 potty training, #1 was easy and fun because I started getting announcements about #1, sometimes way in advance of the actual event because they liked potty time and celebrating. Most important tip I can offer is not to rush kids to the potty because pre-school wont take kids that are not potty trained. Your toddler will let you know when they are ready and it doesn’t do much good to start before then.